Adobe Systems (NASDAQ:ADBE), the software company known for ubiquitous creative products such as Photoshop and Illustrator, has seen its shares nearly triple over the past three years. 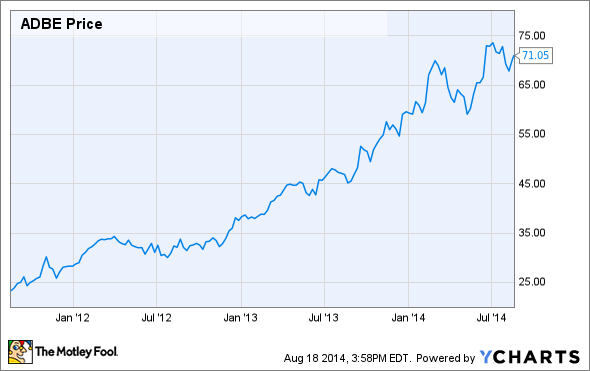 The stock now trades around $70 per share, giving Adobe a market capitalization in excess of $35 billion. This run has been incredible, especially considering that both revenue and earnings declined in 2013 due to the company's ongoing shift to a subscription-based business model for its products. While this move may depress earnings in the short term, there are three compelling reasons why Adobe's stock could continue to rise over the long term. Traditionally, Adobe sold its products for a one-time fee, granting the purchaser a perpetual license. Adobe's wares are expensive, with the latest Creative Suite 6 Master Collection, containing all of the company's creative products, selling for $2,599, and single products such as Photoshop priced at $699. Adobe is now emphasizing a subscription-based model, with its Creative Cloud service charging a monthly fee for access to the company's creative software. What's more, the most recently reported quarter was that last in which Adobe will offer volume licensing of Creative Suite 6. Going forward, the subscription-based Creative Cloud will be the sole focus. This move to a subscription model accomplishes a few things. First, it lowers the cost of entry into Adobe's ecosystem of products. A subscription that includes all of Adobe's creative products costs $50 per month, or $30 per month for existing Creative Suite customers, and individual products can be accessed for $20 per month. Business pricing is a bit higher, at $70 per month for the complete version and $50 per month for existing customers. Paying $20 per month for a Photoshop subscription is a lot more palatable than a $700 up-front fee, especially for individuals. For Adobe, there is the potential to earn more revenue annually from each subscriber than from the previous perpetual license model. A $50 per month subscription generates $600 per year in revenue for Adobe, and it would take just over four years before the $2,599 cost of the CS6 Master Collection was recouped. If, on average, customers upgraded versions less frequently than every four years, the subscription-based model will generate more revenue annually per user. Greater accessibility combined with the potential for more revenue per user annually means that, once the negative short-term effects of the shift play out, Adobe's core products could generate significant revenue and earnings growth over an extended period. Beyond creative software, Adobe also offers cloud-based marketing solutions sold as the Adobe Marketing Cloud. In fiscal 2013, Marketing Cloud generated $1 billion in revenue, growing by 26% from the preceding year; 64% of the Fortune 500 companies use the product. Adobe estimates that the total addressable market for Marketing Cloud will be $21 billion by 2016. With the product representing roughly a quarter of Adobe's total revenue, Marketing Cloud is already a very important piece of the company. Adobe is targeting 20% revenue growth for Marketing Cloud this year, and if this double-digit growth continues, earnings and the share price could rise significantly in the long term. Many of Adobe's products have become the industry standard, and Photoshop is so widely used that the term "photoshop" has become a verb. There are plenty of alternatives, such as the free GIMP,, but Photoshop is an example of a piece of software that has become so ubiquitous that people are willing to pay for it. This is one reason why the shift to the cloud is likely to succeed for Adobe. So many people are already familiar with Adobe's software that switching to an alternative would come with significant switching costs. So while a subscription-based service may end being more expensive more than perpetual licenses, I doubt there will be many defectors among Adobe's enterprise customers. While Adobe's shift to subscriptions is causing a short-term decline in revenue and profit, in the long run the subscription-based model has the potential to drive serious growth, thus powering the stock price higher. Add the fast-growing Marketing Cloud and the ubiquity of Adobe's products, and there are plenty of reasons to believe the stock could continue to rise.